Everyone comes to tea by a different path. If you grew up somewhere like the United Kingdom, it’s likely that you encountered it at a very early age and grew up with it as an integral part of your life. For yours truly, tea was nowhere on my radar growing up and I gradually eased my way into the tea world in my fifth decade of life. For the last tea person I wrote about (Roy Fong), the introduction to tea came at age 6, courtesy of laborers he observed brewing it gong fu style in Hong Kong. As Donaldson notes in an interview at her web site, she grew up in the South, “where the table was never set without a pitcher of iced tea,” but which was typically Lipton black tea with lemon and a substantial dose of sugar. 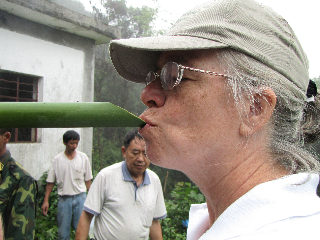 With that in mind, her introduction to fine Chinese green tea must have made quite an impact, given that these days Donaldson has quite a lot of tea writings under her belt and has been involved with the San Francisco International Tea Festival since 2011. Among Donaldson’s tea-related writings are the Emma Lea books, a series of children’s picture books. Things got underway with Emma Lea’s First Tea Party several years ago and the series now numbers six volumes in all. The latest volume – Going Gongfu, A Tea Adventure In China – finds the somewhat grown up young protagonist heading abroad for a great tea adventure. As the author notes, the book was inspired to real-life events, specifically a tea tour she took that provided the inspiration for Emma Lea’s fictional adventure.